April's Science Club benefits Jan's Closet with a paleontology Book Fair tie-in! Can you help punch cards? Please remember to refer to the school and district calendars for other important dates and events, and the Calendar tab on this website for all WSA events. An academic year calendar overview is also available to download from the Calendar page. Also note that school events such as field trips are not listed here; refer to e-blasts and teacher newsletters for this kind of information. The Dino-Mite BOGO Book Fair is coming April 29-May 3! April's Science Club meetings will tie in to the Dino-Mite Book Fair with a paleontology theme. Science Club is free to attend (always! ), but students who are interested and able are invited to bring a donation to be used to purchase book fair bundles for Whitehills students served by Jan's Closet. We are seeking people for leadership roles next academic year: the WSA Secretary position is open, and the District Parent Council needs a Whitehills representative. Please contact us if you'd like to know more! We will be adding some special "Goodbye to Whitehills" activities to this year's Carnival! Please spread the word to Whitehills alumni in East Lansing and beyond so they can come back to walk the halls one last time! ​K-2nd grade music class "informances" will take place in May, with dates designated for every class. Check out this flyer from Mrs. Pike for dates and details! The Whitehills Spring Carnival is May 31! Visit our volunteer needs page to see the sign-ups for donations and volunteering! Ask Lynsey Clayton or email whitehillscarnival@gmail.com any questions. Free child care during WSA meetings! 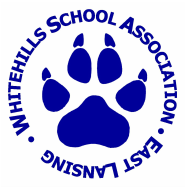 The Whitehills School Association (WSA) is made up of volunteer parents and other individuals dedicated to supporting the children, teachers, and mission of Whitehills Elementary School. If you're a Whitehills parent or guardian, you're already part of the WSA. All members have full voting rights on WSA decisions. Your input is vitally important to our school, and we hope you are able to join us for our next meeting. Meetings are held August through May on the second Tuesday of the month at 6:00pm in the Whitehills Library (unless otherwise noted on the calendar; dates do shift occasionally).